This page has been visited 06365 times since . The NT'07 Conference Venue is the Parque Metalúrgico - Centro de Artes e Convenções da Universidade Federal de Ouro Preto (Conference Center) in Ouro Preto City, situated in the State of Minas Gerais, Brazil. Ouro Preto, located 90 km from Belo Horizonte (capital of the Minas Gerais State), is the cradle of the first Brazilian Mining School and a UNESCO Cultural Historic Patrimony of Mankind. With a 300 year old history, this city counts among the most important tourist attractions in Brazil, where history and mining are intimately intertwined. With its churches and houses of the Brazilian Colonial Period, the baroque collections, the magnificent sculptures by Aleijadinho, and its museums, Ouro Preto tells a history of wealth, mining, smuggling and riots. 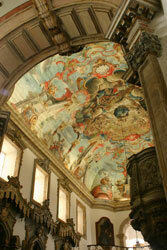 This cultural scenery is central to an important period of Brazilian history. 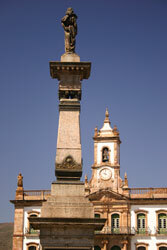 Ouro Preto can be reached by bus from Belo Horizonte international airport (CNF - Tancredo Neves International Airport, Confins), which has frequent connections to São Paulo and Rio de Janeiro. Transport from and to the CNF airport will be provided by the conference upon request (see link TRANSPORT AIRPORT-OURO PRETO). If you do not use the transportation provided by the conference, you still have two possibilities: You can take a taxi from the CNF airport to Ouro Preto (about 250,00 R$). You can also take a bus from the CNF airport to the Belo Horizonte's Central Bus Station ("Rodoviária de Belo Horizonte"), and from the bus station you take another bus to Ouro Preto. The buses leave about once an hour. However, be aware that it will be difficult to find an English speaker for information outside the airport. Relatively inexpensive flights from the Rio de Janeiro (RJ) Galeao airport (GIG) to the Belo Horizonte (BH) Confins airport (CNF) can be booked and purchased on-line on two Brazilian airline companies, namely TAM (IATA code JJ) and GOL (IATA code G3), with round-trip ticket prices even below US$50. De/Origem=From (use GIG), Para/Destino=To (use CNF), Ida = Trip, Volta = Return, Ida e Volta = Round-Trip, Procurar Voos = Book Flight, Senha = Password, Verificar Preco = Verify Price. As on other airline web pages, you may need to register first. Visa Requirements: Brazil has reciprocity agreements with many countries and, as a result, visitors from some foreign countries need a Visa. It is recommended to contact the nearest Brazilian Embassy or Consulate in your city, at least 45 days prior to your travel, to obtain all necessary information. The Executive Secretariat, upon request, may provide an official invitation. Requirements for a tourist visa include a valid passport for at least six months from the date of arrival, one passport size photograph and a round trip ticket. Most international airlines can advise on visa requirements. The registration fees do not cover the insurance regarding accidents, sickness, or loss of personal properties. We suggest to each participant to buy your travel and health insurances before you start for Brazil. 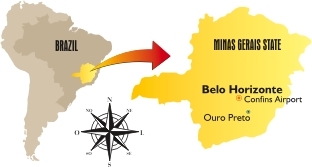 Phone and fax in Ouro Preto and Minas Gerais: To reach Ouro Preto from other Brazilian cities, dial: 31 or 21 followed by 31 and the phone or fax number. To reach from outside Brazil, dial (55 31). Weather: The weather in Ouro Preto in June is cold, with temperatures ranging between 12°C and 20°C during the day and between 8°C and 14°C during the night. Local Currency: The Brazilian monetary unit is the Real (R$), divided into 100 cents (Centavos). Foreign Exchange: The exchange rate available to visitors is published daily in the newspaper along with the commercial American dollar rate of the day used in official international business transactions. Cash and traveler checks, especially US Dollars, can be exchanged at most banks or exchange houses as well as at the major hotels and jewelry stores. All major credit cards are accepted. In September 2006, 1 USD = R$ 2,20. Subject to changes. Visit the website www.oanda.com/converter for information on the exchange rate for your own country. 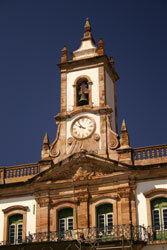 Time: Ouro Preto time is GMT less 3 hours. 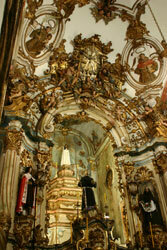 Electricity: The voltage in Ouro Preto is 127 V, and the frequency is 60 Hz. Average altitude: 1.116m. The highest point is the Itacolomi Peak, with 1.722m. Attention: Ouro Preto is an hilled town that preserves its ancient stone paved streets, which, in turn, can be very slippery. Walking shoes are recommended. The Metallurgic Park – Center of Arts and Conventions of the Ouro Preto Federal University (UFOP), is one of the most appropriate areas in Ouro Preto to medium and large sized events. Built in the year 2000, since then the Convention Center receives between 80 and 120 events per year, among congresses, symposiums, workshops, artistic presentations and exhibitions. The Convention Center is located in the historic center of Ouro Preto, next to the historical train station and to the office of the rector of UFOP.